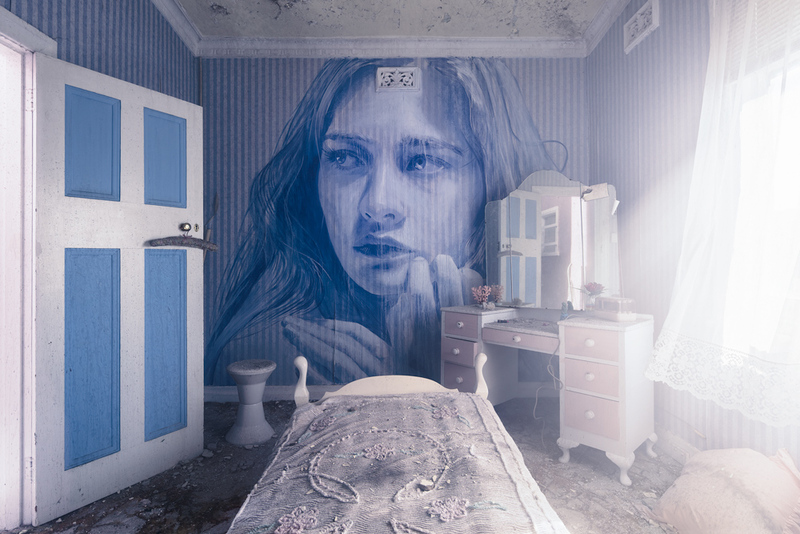 The street artist Rone from Melbourne has presented his new artwork: The Omega Project, which displays the dying traditions of Australian life in the middle of the last century, picturing beautiful artworks in the abandoned house. Rone turned one of the oldest abandoned mansions in Melbourne into a temporary exhibition, open and accessible to everyone to visit. However, the show will last only seven days, since the building was sentenced to demolition even before the start of the project. This cottage is one of the last survived buildings of that time, located in the modern extensive residential complex in the north of Melbourne. “The Omega Project is a project that includes a series of works and installations in a building that will soon be destroyed. This work ultimately recreates the elements of a classic Australian house of the middle of the last century, with the inherent destruction that reflects its age. The project incorporates memories of those homes that I have already visited and those abandoned buildings that I have already explored.“ – Rone. Street artist Rone finds that fine line between beauty and ruins; the youth, and decay. On the walls of the dilapidated mansion, overexposed beams and bricks, are depicted large-scale portraits of women with beautiful facial features. Another of his work ‘Empty’ was posted in the lyric theater in Fitzroy in a building that was also doomed to demolition. Teaming up with the stylist Carly Spooner, the Street artist created the effect of the cinematic sensation of space. He managed to recreate the archetypal landscape of the Australian interior of the middle of the century with chenille coverlets, wood TV, and other small antique interior details.